Whisk together flour, baking powder, and 3/4 tsp salt in a bowl, then blend in cold butter (3/4 stick) with your fingertips or a pastry blender until it resembles coarse meal. Add milk, stirring until mixture just forms a dough, then gather into a ball. Divide dough in half and roll out one piece on a well-floured counter (my choice) or between two sheets of plastic wrap (the recipe’s suggestion, but I imagined it would annoyingly stick to the plastic) into a 12-inch round (1/8 inch thick). 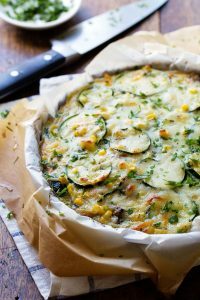 Either fold the round gently in quarters, lift it into a 9-inch pie plate and gently unfold and center it or, if you’re using the plastic warp method, remove top sheet of plastic wrap, then lift dough using bottom sheet of plastic wrap and invert into pie plate. Pat the dough in with your fingers trim any overhang. Preheat oven to 400°F with rack in middle. If your kitchen is excessively warm, as ours is, go ahead and put the second half of the dough in the fridge until you’re ready to use it. Whisk together mayonnaise and lemon juice. slice tomatoes crosswise 1/4 inch thick and, if desired, place on towel and sprinkle with salt. let sit for 30 min or more. Spread 1 tbsp dijon on crust. 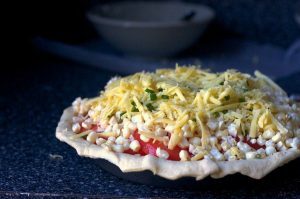 Spread a small amount of cheese on crust then Arrange half of tomatoes in crust, overlapping, and sprinkle with half of corn, basil, chives, salt, 1/8 teaspoon pepper and one cup of grated cheese. Repeat layering with remaining tomatoes, corn, basil, chives, salt, and pepper. Pour lemon mayonnaise over filling and sprinkle with remaining cheese. Roll out remaining piece of dough into a 12-inch round in same manner, then fit over filling, folding overhang under edge of bottom crust and pinching edge to seal. Cut 4 steam vents in top crust and brush crust with melted butter (2 teaspoons). Bake pie until crust is golden and filling is bubbling, 30 to 35 minutes, then cool on a rack. Serve warm or at room temperature. Do ahead: Pie can be baked 1 day ahead and chilled. Reheat in a 350°F oven until warm, about 30 minutes. An idea: Want to slab pie this and serve it to a crowd? I agree, it would be brilliant. This is how I’d approach it: Make 1 1/2 batches of the crust (slab pies require more crust for the same amount of filling) and arrange the filling in one layer instead of two in a parchment-lined 15x10x1-inch pan. Increase the amount of butter you brush the top with to a tablespoon or two and the baking time to about 45 minutes (this is an estimate, you should take it out when it is golden and the filling is bubbling). Be sure to remove the tomato seeds; that extra wetness could make for a slab pie mess. Peel and cube eggplant, note do not boil, sautee,boil until soft and tender, then drain water and mash. Add diced onion, garlic, breadcrumbs, egg, melted butter and pesto to the mash; mix well. 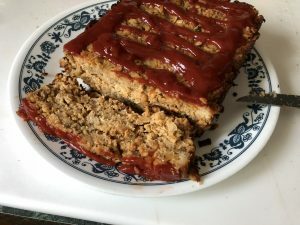 Grease a pie pan. 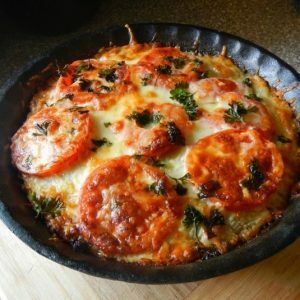 Slice one tomato and layer on bottom of pan. Add the eggplant mixture. Slice the remaining tomato and layer on top of eggplant mixture. Add shredded cheddar cheese and sprinkle with fresh parsley. Bake at 350°F for 30 minutes or until golden brown. Preheat the oven to 375 degrees. Heat the butter in a large, deep skillet over medium high heat. Add the onions, zucchini, and mushrooms. While the veggies saute, cut the corn kernels off the cob. Add them to the pan and continue to saute until the veggies are soft, 5-10 minutes. Remove from heat. Once the mixture has cooled for a few minutes, stir in the basil, oregano, salt, cheese, bread crumbs and the beaten egg. Line a pie pan (9-inch or larger) with parchment paper or just grease a pan with nonstick spray. Transfer the mixture to the pan. Arrange the top so the zucchini slices lay flat and look nice. Top with a little extra cheese for looks, cover with greased foil, and bake for 20 minutes. Remove foil and bake for an additional 5 minutes to brown the top. Let stand for 10-15 minutes before cutting into slices. 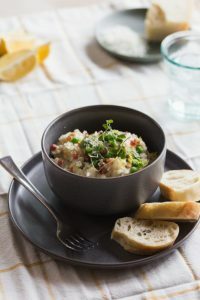 Using the saute setting on your Instant Pot, heat 1 tablespoon of the olive oil, add the garlic to the pressure cooker and cook until fragrant, about 1 minute. Add the rice and salt and saute until toasted, 3 minutes. If using, pour in the wine and let it simmer until it has evaporated. Add the broth and stir to combine. Cover with the lid and cook on HIGH pressure for 6 minutes. Release the pressure manually and stir in the peas, Parmesan, and lemon. 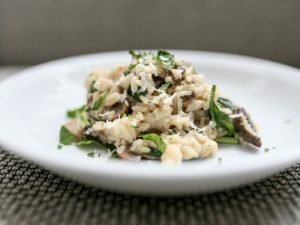 Keep stirring until the risotto is creamy. Season to taste with salt and cracked black pepper. Just before serving, garnish with the remaining parmesan and greens. Place a large dry nonstick skillet over medium heat, and add almonds. Stir constantly until they are tinged with color. Take from heat, and transfer to a bowl to cool. Season both sides of the fish well with salt and pepper. Place the same pan over medium heat, and add butter and olive oil. When both begin to bubble, add cod fillets skin side up. Brown fish until opaque all the way through, turning once, 3 to 4 minutes a side. Transfer fish to a warm serving plate, skin side down. Reduce heat under pan to low, and add lemon juice. Stir to blend with butter and oil, then pour this sauce over fillets. 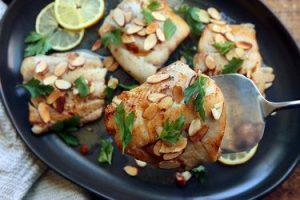 Scatter parsley over cod, and scatter with toasted almonds. Serve immediately. Preheat the oven to 425°. In a large baking dish, season the fish fillets with salt and pepper. 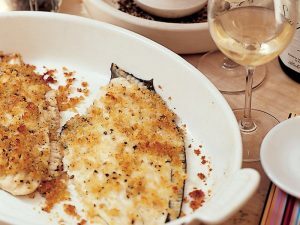 Mix the Parmesan with the bread crumbs, melted butter and olive oil and sprinkle over the fillets. Bake for 15 minutes, or until the fish is cooked and the topping is golden. Let stand for 5 minutes before serving. place all ingredients in instant pot. Add the butter and oil to the Instant Pot. Hit “Sauté” and “Adjust” so it’s on the “More” or “High” setting and wait until the butter has melted and it bubbles. Add the onion and cook for about 2 minutes so it softens and just lightly browns. Add in the butternut squash and stir with the onions for another 1-2 minutes (the squash will be very hard, but don’t worry – it will completely soften up after pressure cooking). Next, add in the mushrooms, stir and cook for another minute. Finally, add the garlic, stir with everything else and cook for another 3 minutes. Add in the white wine and once it bubbles, let it do so for another 2 minutes so some of the alcohol burns off. Add rice and stir. Add in the broth, seasoned salt, white pepper, black pepper, nutmeg, Italian seasoning and dried parsley. Stir well, deglazing the bottom of the pot and then place the spinach on top (but do NOT mix in with everything else – just let it rest on top. Also, it may look like a LOT of spinach is in there but you’ll be shocked at how it cooks down). Secure the lid, hit “Manual” or “Pressure Cook” High Pressure for 6 minutes. Quick release when done and stir the spinach in with the risotto (when you do this, the spinach will have become nothing but little green strands). Add in the grated Parmesan, stir and transfer to a serving bowl.